While learning about insulation technologies from various chaps, I wondered why curtains weren't much mentioned. Curtains seem to be thought of as some kind of household accessory - something to accent a room (the curtains that were here when we moved in certainly lent moods to the rooms). But no one we spoke to seemed to rate curtains as insulation. This struck me as odd, as I know the importance my mother placed on well-lined curtains in the house I grew up in. We drew the curtains as soon as dusk fell, and we were told that this 'kept the heat in'. So off I went to see what lies behind that belief. I did quite a bit of research and recommend this article on fix.com for a good overview of the physics behind curtain insulation. The fact that hit hard me was that an uninsulated single glazed window will lose heat 4 times faster than an uninsulated wall - I mean - you kind of know that instinctively - glass windows are cold. From there it's no big leap to figure out that curtains can add considerable insulation value in houses, whether that be on doors or windows. The thing is, it's not just any old curtains hung any old way...curtains must be properly hung to maximise their insulation value. And it turns out that most of us hang our curtains wrong. All those open-top, free falling curtains most of us install on a curtain rail jutting out from the wall might be easy to install and hang, but aren't very effective at insulation. 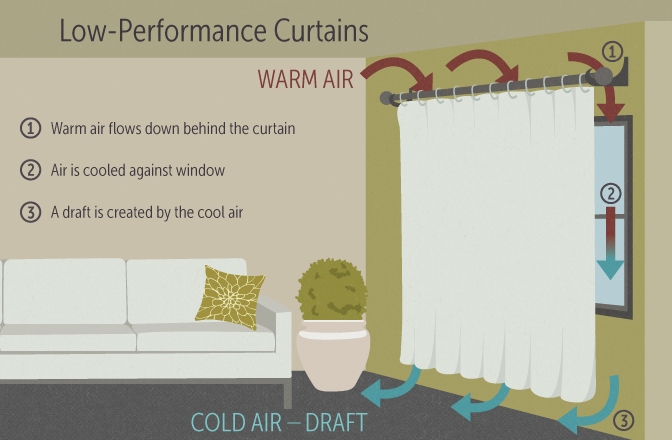 That's because the air you've warmed with your heating falls down the top of the open curtain, is cooled by the cold glass, then flows back into the room as a cold draught (see this 'in action' on a diagram at fix.com). Then repeats the process...brrr...! The trick to interupting this airflow is to make your curtains as airtight as possible. And it turns out that the Victorians weren't fond of pelmets simply as a fashion statement. 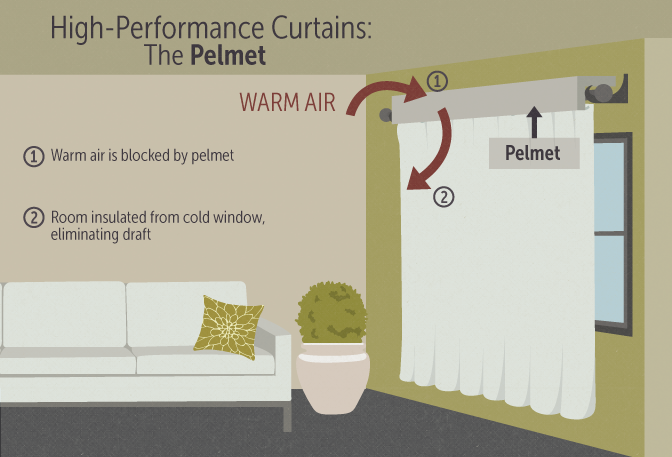 Pelmets act as a 'hat' on top of your curtains - stopping that flow of warm air from falling down the window and circulating back into the room. Love 'em or hate 'em, pelmets aren't a high fashion statement - they're low tech (and low cost) insulation. Making the most of your curtains doesn't end with fitting a pelmet. Just as we dress in layers on a cold day, to trap air that our bodies heat up which keeps us warm, anyone interested in insulating a house using curtains should use layers. The ideal is of course heavy curtains that have been thermally lined that fall from pelmet to floor - thus interupting that flow of warm to cold air. Some energy-saving geeks even advocate using magnetic tape on the wall and curtain, to ensure a tight seal that will block off all draughts. The Victorians - and more expensive curtain-making companies - will sometimes use weights to achieve some of the same effect (the curtains will 'fall' beautifully - and will ensure there is no gap to let draughts through). In our house there was just one pelmet left in one room, as it looks like all the original pelmets were ripped out when the new windows were fitted. The curtain rail inside the pelmet had warped and was unusable so we took it down and have stored it in case we can salvage the pelmet at some point. The curtains that hung in all the windows when we moved in had the haunted house vibe that made our Halloween party so atmospheric, so I've been on the hunt for stopgap curtains that will help our insulation but won't break the bank while we get started on small works in the house. I've hung several mismatched and mostly too short sets of curtains donated by friends and family in various windows but really wanted to sort the curtains for our chilly front reception room. In November I managed to get my hands on a set of felt-lined heavy gold/olive striped curtains with the required 300 cm drop. I picked these up on eBay for not very much (the postage being almost half the price of the curtains!). I was curious to see what - if any - difference they would make to the temperature in the front reception room. Hanging the curtains on the existing curtain rail was a 2 person job, and hard work. But the result - even without a pelmet - is a measurable difference to the heat of the room, particularly first thing in the morning. If I stick my arm into the bay window recess in the morning, I can feel the chill of the air in behind the reasonably warm room. And these curtains look a lot better than what we had before. Now I'm on the hunt for curtains - and fittings - that will work this same magic for the upstairs master window (which is FREEZING!) and the bedrooms we use (which, having much smaller single windows, are not so cold). Buy good quality, lined curtains that fall from window top to floor (not cheap). Fit the curtains so there are no gaps between the wall and the floor (so no curtains poles that stick way out into your room - keep them close to the wall). Fit a pelmet (not easy...and perhaps not to your aesthetic taste - but as good as wearing a hat on a windy mountain). Finally I have to mention the single biggest drawback of curtains (see what I did there? )...for your house to benefit from the insulating value of curtains, they must be drawn...all the time your curtains are open, they're just looking pretty.